Remote technical support, also known as ‘online support’, allows us to remotely view your computer screen and securely fix most computer and network problems right through the Internet via remote control. In fact, it’s like watching your computer fix itself! 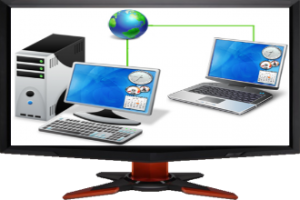 This type of computer support works through ‘desktop sharing’ technology. What this means is that when you ‘log in to our secure online support center’, you can allow a technical support representative to ‘view’ and ‘interact’ with your computer remotely via the Web – fixing problems fast. How can Remote Technical Support help me? perform technical maintenance, windows updates/patches. locate and remove viruses and install and configure anti-virus software. fix printer, scanner, digital camera and other technical problems. speed up your computer and also increase it’s performance; run PC tune-ups. install, configure and train on new software and hardware. assist in data back-up processes, transferring data from one PC to another. Why is remote technical support better than more traditional support options? Traditional technical support options have been to wait on hold with a PC or software vendor, take your computer to a local repair shop and wait for days for your PC to be repaired (costly) or to wait for a technician to visit your home (also, very costly). Remote computer support allows us to interact directly with your computer so you don’t need to perform sometimes complicated telephone instructions on how to fix your computer by yourself. In this way our remote technicians can identify and resolve technical problems much faster, which costs you much less. Many of us don’t have time to figure out what’s wrong with a PC or network, and would rather have an experienced technician look at their PC. Also, there’s no waiting on hold or the need to call multiple vendors for support. So, remote technical support is less expensive, easier to use and much more convenient than traditional computer technical support or repair services. Very! By allowing a remote support technician to access your local computer through the Internet they are able to fix your computer directly. You can simply sit back and watch. Or, you can work on something else while the technician is fixing your computer. Remote PC support is a simple, convenient and, best of all, it’s ‘hands-free’.